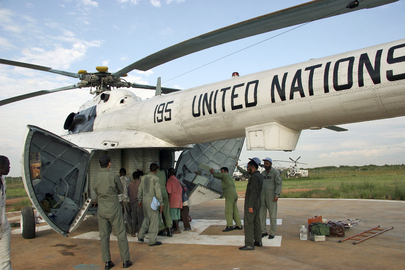 A Rwanda Air Force Mi-17-1V helicopter has crashed in South Sudan whilst on a United Nations flight. The aircraft came down outside Pagak in northeast South Sudan on 15 March, damaging the main rotors, tail boom and underside of the aircraft. All eleven occupants escaped without injuries. Rwanda has been flying Mi-17s in South Sudan on behalf of the United Nations since 2014. According to Scramble, the Rwandan Mi-17s belong to the Transport Helicopter Squadron based at Kigali (Rwanda), which operates some twenty Mi-17s in several variants (Mi-17MD, Mi-17V, Mi-17V-5, Mi-17-1V, Mi-171 and Mi-172). The Rwandan crash comes a month after an Ethiopian military Mi-8 helicopter crashed inside a United Nations compound in the disputed Abyei region between Sudan and South Sudan. Three crewmembers were killed in that crash on 9 February and ten passenger critically injured. The helicopter was carrying Ethiopian troops from Kadugli in Sudan to Abyei, which has been contested since South Sudan gained independence in 2011.